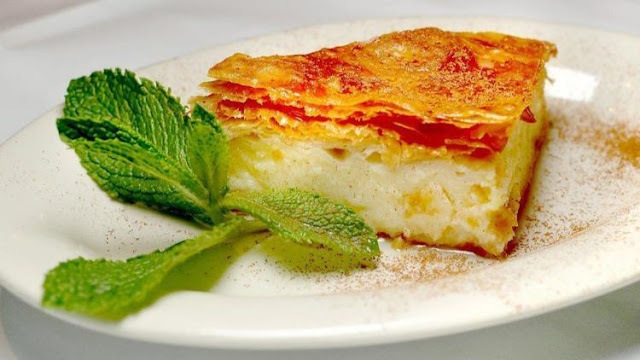 The Greek custard pie, known as Galaktoboureko, is unlike pie in the traditional American sense. It’s baked in a rectangular pan, the custard is made with semolina, which gives it a slightly grainy texture, and the light crust comes from layers of paper-thin phyllo dough. Sometimes simple is best. 1. Combine sugar, water and lemon zest in a small saucepan over medium high heat. Bring to a boil, reduce to a simmer and cook until sugar is dissolved. Remove from heat, stir in honey and set aside to cool. 2. Preheat oven to 350 degrees F. Butter a 9 x 13 baking dish. Layer the bottom and sides of pan, allowing some overhang, with 8 sheets of phyllo dough, each brushed with melted butter. 3. Pour the semolina custard into the pan and spread evenly. Fold overhanging phyllo onto custard. 4. Layer the remaining phyllo sheets over the top, brushing each sheet with butter. Use a sharp knife to make a diagonal slice on the top to allow steam to escape. 5. Bake until phyllo is crisp and golden brown, about 40 minutes. Slowly ladle the cold lemon syrup over the Galaktoboureko, letting each spoonful absorb. Allow to cool, cut into squares and serve. 1. Pour milk into a large saucepan and bring to a boil over low heat. Remove from heat. While waiting for milk to boil, whisk eggs, semolina and sugar together in a large bowl until thoroughly combined. 2. Using a wooden spoon, gradually stir egg mixture into milk until combined. Cook over low heat until custard starts to bubble and remove from heat. Add butter and lemon zest and stir until combined.